Here’s the dyno results. Again 25 wheel horsepower is the cheapest gain you will ever get. All running stock tuning. Can’t turn down the radio in reverse on my 14. That they do. Big ugly chunk of steel/ aluminum on the front. Unless it’s used as a tool or purpose I just don’t get it. Looks terrible and seems like a downgrade. The tire of choice is Michelin defender Ltx or Michelin premier choose one of those, this is the concenus in Tahoe/Yukon forum when it comes to balance issue and no other choice. 14 5.3 Sierra Denali. Tow my 10,000 gvwr travel trailer fine. Weighed trailer and came in at 8900lbs and truck had 300lbs payload left. 1/2 tons today have better brakes than older 3/4 tons. Wouldn’t be to concerned. Get your weight distribution hitch set up correctly and sway control and you’ll be fine. How many miles - major engine or trans issues? NHT Max Tow come without tow mirrors? Good point. I'll make sure to check for the code in case someone is trying to pass one off as a max tow. I might as well keep my current truck unless I find a 6.2 with the lower ratio rear end or i wont be gaining much. 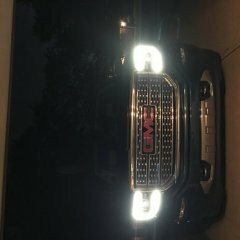 Looking to replace my current 14 sierra denali 5.3 with a similar priced SLT 6.2 max tow. Question: Did all max tow trucks come with the tow mirrors? Been searching for max tow trucks and wondering if this would be a quick way to distinguish if truck is equipped with the NHT package. I am not finding to many of these trucks for sale in alberta. Budget limits to about 2014-2017. Towing 9000lbs travel trailer with the 5.3 and wanting just a little bit more power. I dont want a 2500 and current truck does fine but could could use a little more power so dont even bother telling me to get a tired 6.0. Ive actually towed this trailer with both a 6.2 max tow and a 2015 2500 6.0 and prefer towing with the 6.2 for my needs. Why the 10 speed hate?? Seems to make sense. Can have a 3.23/3.42 rear end with 3 overdrive gear for running empty with increased fuel mileage. But have a lower overall gear range, better than what 4.10’s can offer with a 6 speed. Effectively could be equal to 4.56 6 speed. 10L90 tows great and drives great. Stays in the power with out the huge drop when shifting. Linear power output. Change isn’t bad guys. No, it’s 2020. I expect my truck to perform and evolve. My 1/2 ton is great and am amazed in the advancements made between my 6.2 LS based engine I previously had and now 6.2 direct injection engine. Mileage greatly improved and performance. Why is it wrong to expect the same out the of the new 6.6. The 4.10 gearing comment. That’s why these trucks need a 10 speed. Better overall ratio for highway cruising but still have a lower first gear than the 4.10’s You guys are living in the Stone Age. I expect 2500 hd’s To evolve as the half tons did. The 2500hd gas market desperately needed a refresh. Hopefully 2021 gets the updated trans. If this is true then this wont be the engine to get me into a 3/4 ton. Probably 1000lbs difference between 1500 and 2500, expect better than the 12mpg empty I get currently driving 6.0 trucks. My 6.2 gets 20mpg pretty easily. I wish I had the option to build a 2500HD 6.2 with 10 speed. My AFM direct injection engines hold up fine to the abuse I put them through in the past. I just want 6.2 towing performance and fuel economy in a 2500 hd truck. I do realize this will be a heavier truck than a 1/2 ton so wont perform quite as well, but the 6.0 now does not suit my needs for power and fuel economy. Hoping the 6.6 will be the engine to put me in a 3/4 ton. I haven't drove a ram 2500, but I do agree on the reliability and will never personally own one due to this. Our company claims the same cost of ownership between ford and gm so those are the choices when it comes time to order a truck. Excited for gm to finally replace the old 6.0. Funny some saying gm should keep it as it’s tried and proven. With this mindset we should still be using small block tech from the 60’s. I want a gas HD truck but the mileage and low output kept me from buying a 6.0. I personally want AFM and direct injection. This will also be my daily driver so mileage is a huge factor and reason I don’t have one now. I currently have a 5.3 and 6.2 in half tons and am amazed with the 6.2 mileage for the power output. Pull a 8000lbs trailer so that’s where I would like the HD. Now for the commercial fleet side, I keep hearing that mileage isn’t important. I work at a company that runs 100’s of trucks with the option of using the gm 6.0. All I hear is underpowered and to hard on fuel and I agree. I don’t want to fuel up everyday and not have the range. So when it comes time to order a new truck hardly anyone orders this option. We get a choice.